... keeping mercy for thousands, forgiving iniquity and transgressions and sin. 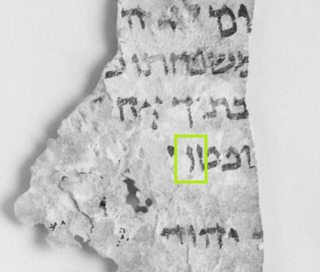 In some Torah scrolls, the Nun in the word נצר "keeping" is written larger than normal. What is the significance of this enlarged Nun? Although I don't recall where I saw this (it could have been in the commentary of the Komarna Rebbe to the Torah) The enlarged Nun found in 34:7 is connected to the enlarged Resh which follows it in 34:14. Together they form the word 'Ner' (נר). In context of the end of the parsha, this seems to be alluding to the light which radiated from Moshe's face at the conclusion of this event in posukim 34:29-30. And because of that light, the Jewish people were afraid of Moshe and moved away from him. But Moshe called the leaders of the generation back and gave them a new, additional mission (called shlichut in Hebrew) like is found in note 20 of Siftei Chochamim to Rashi on 34:31. That mission was to teach the entire Torah and all the mitzvot to the Jewish people and that this should be an occupation every day. The Shelah HaKadosh (Maseches Yoma, hilchos teshuva) says that this enlarged nun is an allusion to the nachash that enticed mankind to sin. At the time of egel hazahav the yetzer hara became too strong that it was capable to influence Am yisroel to do avodah zarah. The large letter nun, in this sense, is to call attention to this fact by saying that Hashem (and only Him) can forgive our sins. The following response provides an indirect response to the original question and concludes with the relationship to Exodus 34:7 (i.e., the verse in question). Please click the below image in order to view the source document online. However, when we view the same passage from the Dead Sea Scrolls, there is no apparent large nun evident. In other words, the enlarged nun in the Masoretic Text appears to be a later editorial addition for special emphasis. 3) the letter shows that the reading must be precise. As in the case in Exodus 34:7 (where Midrash appears to have added the large nun) the sole appearance of the only enlarged nun in Numbers 27:5 may have been to provide unequivocal emphasis that the case which Moses brought before the Lord was on behalf of women. That is, the emphasis was that for the first time in the Torah, the rights and claims of women came before the Lord. Yeivin, Israel (1980). Introduction to the Tiberian Masorah. Trans. and Ed. E. J. Revell. "Masoretic Studies," No. 5. Missoula: Scholars Press, 47–48, #84. Not the answer you're looking for? Browse other questions tagged parshanut-torah-comment aleph-bet-letters parashat-ki-tisa .